By Ingrid Taheri, HIGH NOTES AVANTE PRODUCTIONS INC.
A psychotherapist, speaker and classically trained pianist, Paul Radkowski can tell a recovery story or two—whether his own, his clients’ or that of fellow musicians or well-known composers. 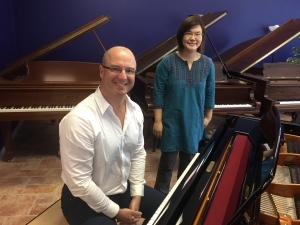 Paul, who also is CEO of LifeRecoveryProgram.com, will present A Musical Journey of Hope at the first ever HIGH NOTES AVANTE SOCIAL at Pearl Piano Studio on 15 Sims Crescent in Richmond Hill, 7:30 pm on September 14. Proceeds benefit High Notes Avante and the registered charity’s efforts to use music to raise the image of mental illness. Paul became fascinated by the lives and recovery stories of the composers he played. He was particularly intrigued by Russian composer Sergei Rachmaninoff who dedicated his second piano concerto—one of the most renowned works in the literature—to his therapist Nikolai Dahl. “The fact that Rachmaninoff could recover from depression brought on by the fiasco of the premier of his first symphony and produce music with such passion, poignancy, pain urgency, triumph and hope–encouraged me to keep going as a human being,” he says. Paul moved on to study music therapy and to deepen his understanding of the intrinsic power of music to heal, as well as neuroscience and biology. The interactive evening at Pearls Pianos includes Paul playing the piano and sharing recovery stories of other composers including Ravel, Gershwin, Beethoven and Tchaikowsky. Vocalist and awarded psychotherapist Monique Peats joins him for a Judy Garland number. Rosa Hei, runner up of the North York Music Festival’s High Notes Gala class, is also performing. Watch Our Video & Smile! © Copyright 2015 High Notes Avante Inc. | All Rights Reserved.